With these Personalized Champagne Flutes as your favors for parties, weddings and showers you'll be the toast of the town. Looking to put your personal touch on your special occasion? Well, here's a one-of-a-kind wedding favor that's clearly filled with personalized panache! From Fashioncraft's Silkscreened Glassware Collection, each measures 7 .75" tall x 2 .25" in diameter, with a 5.75 ounce capacity, in the classic champagne flute shape with a slender bowl top and long straight stem. Made in the USA, each is made of clear glass and they're perfectly fitted to be silk screened with amazing accuracy directly on the glass in a wide variety of all occasion themes, designs, colors and titles that match your theme and your personal preferences. Sure to inspire your guests to raise their glasses in your honor, these personalized champagne flute favors come bulk packed. Please allow two weeks for silk screening and processing as well as transit time for shipping to your location. These flutes were great quality - heavier than expected! The print was perfect. They are exactly what we wanted to give to each person who celebrated our 50th wedding anniversary. I special ordered as a wedding favor for my guest. They were a big hit and unexpected surprise for our toast. I have no complaints. This company did a fabulous job. I ordered champagne flutes they came wonderfully packaged and they are so nice. I would recommend ordering from them. I ordered these for my best friends bridal shower, 75 glasses in total. Everything came exactly as I designed, and the quality was way better than I expected for the price. Heavy duty glass, not cheap at all. Would highly recommend for your next event. Glasses were beautiful and shipment came in more than enough time. Only issue was the boxes that I ordered to put them in, I was one short. 30 glasses with 29 boxes. The product was better than expected! The monogram flutes were perfect! Nice touch for a bridal shower! Thank you! I needed these glasses for my parents 90th birthday party a bit quicker than the stated turnaround and Nicepricefavors made it happen. I felt like I was on the phone with a company from the old days-cares about the customer and very friendly. Thank you so much. The glasses were a hit! We are very pleased with the product and we received them as promised. The flutes arrived on time as promised, intact, nicely personalized, and were a big hit at the celebration. Flutes were reasonably priced, but the shipping (normal) was quite costly. Thanks. The flutes were absolutely perfect from the glass itself right down to the nice white box. I ordered them for a baby shower and everyone loved this in the favor bags. My cousin and the bridal shower guests loved the party favors. They came out exactly the way it looked on the screen when I was designing the logo. I really like the flutes however they are a bit shorter Than I thought they would be. Very good price and came quickly. We ordered these as favors for a bridal shower and they were a huge hit! 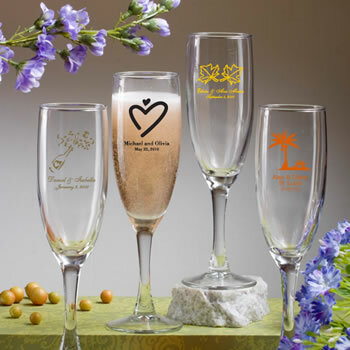 Beautiful glasses that guests will keep as a memento of the special occasion.